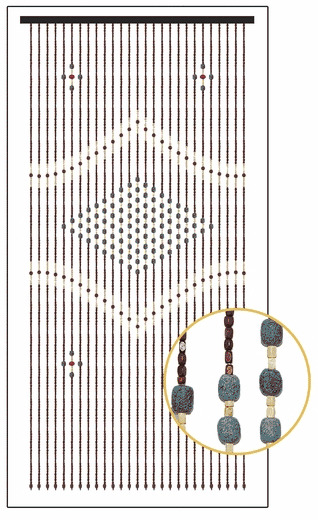 Wooden Bead Curtain - Genie - Blue Center - 35.5" x 70" - 27 Strands of wooden beads in irregular shaped squares in light beige and dark brown, accented with cherry red and marbled blue/light gray circles. The pattern is simple yet interesting, making it easy to fit into many Decor styles. The header rail is black and has 2 eyelets for easy installation. Each strand is finished with a wooden bead, giving a nice finished look. 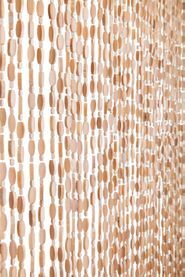 I've always wanted a curtain with wood beads. I decided on the Genie w/the blue center. So glad I did. It is beautiful. Hangs so nice and the design is perfect! ConsThe length could be an inch or so longer. I received these (3) beauties a few days ago and put them up immediately (all by myself in about 15 minutes...that's 5 minutes only each!). There are no words to describe the beauty of these...I cannot remember the last time a single item in my home changed the "vibe"....I love looking at them, walking through them (such a beautiful sound they make). I am in love! I was a bit surprised that they do not reach the floor but that was an assumption on my end because I guess my doorways are higher than average? Still in love! ConsLittle shorter than I thought. The product itself seems to be made from a high quality of materials, with a high level of care. You'll notice at several stages of your purchase that this company is really awesome. The website itself might need some work, but once you're past that, you get nice little messages from the company like "You're awesome, thank you so much for your order, we hope you love it!" or something similar that just makes you feel good and seems to go the extra mile. I know that this doesn't mean much if the product itself is bad, but in this case it isn't so I just think that extra stuff is funny and nice. ProsCheaper and probably better than anywhere else you can find this online. I got exactly what I expected. The beads don't snag not things as I walk through them. If you want to really cover something up, get a 52 strands product, not 27. I am going to re-order to get a couple of 52 strand curtains. It adds a wonderful flare to the room, and it is easy to walk through. For our new construction retirement flat this product is perfect. It adequately separates a bedroom from the living area. The quality of this item is much more than I expected it's thick thick and Durable. The beads are well-made and the paint on them is really really nice. I would recommend this product. ProsAdd A bit of Retro but classy style to this room. Nice colors and evenly spaced out. Not too many beads. I love them!!! Love these. The colors are amazing same with the quality. I just wish it was thicker for more coverage. Lovely item. Very easy to install. Happy with purchase and fast shipping. ProsEasy installation. Beautiful design and colors. I love the look. Strands were too thin. I am thinking about ordering another to make the strands thicker on the one I have purchased already. Seems like there is an inch between each strand. All and all, I do like it. I will love it once I tweak it a little bit.